The thorny topic of immigration reform has catapulted to the top of the to-do lists of both Republicans and Democrats, even as both sides continue to bicker over details. President Barack Obama and a bipartisan group of senators are eager to pass an immigration bill this year, with their main points of disagreement, deliberated in public and in private, centering around topics like border security, guest-worker programs and how long undocumented immigrants should have to wait before gaining citizenship. There's one issue, however, both sides agree on: The nation’s 11 million illegal immigrants will need to know English before they can earn permanent legal status, commonly referred to as a green card. And therein lies a barely discussed problem with the potential to overwhelm states and put up a barrier to immigrants who want to legalize: The nation’s English as a Second Language system may not be up to the task. Those familiar with the issue say the woefully underfunded adult ESL system would face challenges that could stretch it to its breaking point. They include the influx of millions of new students, a severe lack of clarity around funding, and the need for more flexible learning situations, as many immigrants—who often work several jobs—will find it difficult to attend classes. The current ESL system is "cobbled together with toothpicks and Band-Aids,” said Paul Musselman, the president of Carnegie Speech, a virtual learning company that makes language software. It would be “insane” to require illegal immigrants to learn English, added Leslie Robbins, the executive director of Riverside Language Program in Manhattan, which teaches legal immigrants intensive English courses. For one, she noted, the system is already overloaded. "There's not enough funding currently to deal with the numbers of people who both need and want English-language instruction," she said. And Margie McHugh, an expert on immigrant integration issues at the Migration Policy Institute think tank, noted that “the idea that somehow the system could accommodate 11 million new people is beyond anyone’s imagination." McHugh estimated that, without schooling, about 55 percent of undocumented immigrants wouldn’t be able to pass the English portion of the U.S. citizenship test—which requires someone to understand English phrases when spoken to slowly and with repetition—if it were given today. That means about 4 million to 5 million people could simultaneously need instruction under the immigration reform law. But the current system in place for teaching English to the nations’ immigrants—state- and federally-funded classes provided by a patchwork of community colleges, public libraries and other community organizations—has been hit hard by state budget cuts since the recession began. Nationwide, 1.1 million people were enrolled in ESL courses in the 2006-2007 year, compared with just 730,000 people last academic year due to those cuts. States may end up shouldering hefty costs associated with immigration reform if lawmakers don’t explicitly reimburse them in a bill. In 1986, Congress promised to reimburse state and local governments $4 billion in costs associated with the amnesty program, including providing adult ESL classes. But even if the money's there, existing ESL classes on average have not proven to be all that effective at teaching its students English, in part because many immigrants don't have the time to attend classes frequently enough to make a difference. Some techies as well as immigrant advocates, however, are hoping new language-learning software and online courses could help solve some of the issues, softening the blow to the ESL system if immigration reform passes. “We need to get out there that there has to be a different way for people to learn English fast and with digital skills,” said Ada Williams Prince, the policy director for OneAmerica, a nonprofit immigration advocacy group. “It’s not enough to sit people in an ESL class." 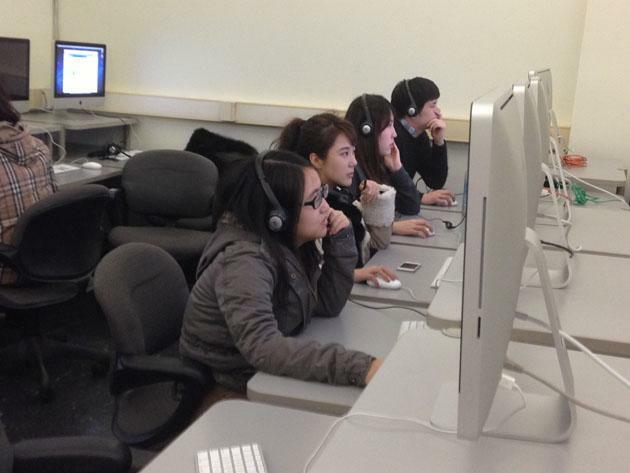 A handful of colleges and community organizations are already experimenting with lower-cost digital ESL classes that use free online language programs instead of costly textbooks. They also allow teachers to have larger classes or, in at least one case, remove the need for ESL-trained teachers altogether. A Gates Foundation-funded pilot program in Washington state—with the help of OneAmerica—taught 250 immigrants English in a 13-week program last year using free language-learning software provided by Livemocha, a Rosetta Stone-like online tool. Students were each given a laptop with a permanent Internet connection and worked in class with the help of a tech coach, but no formally trained ESL teacher. They also spent hours of their own time using Livemocha at home, with the goal of learning both digital and English skills at once. This fall, another online ESL pilot program funded with $3.5 million by the Gates Foundation will begin in 10 community colleges, also in Washington. The colleges, partnering with Livemocha, will create an interactive curriculum including video and text chatting with native English speakers as a way to improve conversational skills. Each student will be given a laptop or tablet, but this time they'll be assisted by trained ESL teachers and tech coaches in classrooms. The colleges hope the program will eventually be cheaper than traditional ESL classes, despite the costs of computers. They also hope the digital approach will be more effective than their previous textbook-based ESL classes, which have had a dismal track record of moving students to higher levels of English. “We don’t believe it is more expensive to put technology in the hands of students than it is to put really not very exciting books in the hands of students,” Kathy Cooper, a policy associate at the Washington State Board for Community & Technical Colleges, said. These types of online language programs weren't available 25 years ago when Congress passed the Immigration Reform and Control Act of 1986, which required the 2.7 million undocumented immigrants who were legalized under that law to enroll in at least 40 hours of English courses before obtaining green cards. No one knows how effective these courses were, because immigrants were not required to take a test at the end of them. But experts estimate it takes about 600 hours of instruction for someone to move from the bottom levels of English understanding to a conversational competence, which suggests 40 hours would not do much toward helping someone become fluent. The Department of Education would have final say on which ESL classes are approved, but experts think it's possible it would approve online classes. “I'm sure that if they go with a 40-hour seat time requirement that many people would try to come up with an online way for folks to fulfill that,” said the Migration Policy Institute's McHugh. She added that the Department of Education would have to create “appropriate safeguards” to make sure the programs were high-quality. Some in the ESL field also cautioned that digital-language programs may make instruction better and more efficient, but it will not replace the need for a qualified teacher and classroom. "When we use technology it’s an enhancement, not a replacement,” said Helene Rubenstein, the coordinator for ESL programs at the School of Visual Arts in Manhattan. Whatever the solution, McHugh said she hopes Congress does not scrimp on funding. Good English classes, she noted, are necessary "if we really expect people to succeed in integrating or improving their long-term prospects of joining their mainstream workforce and community."